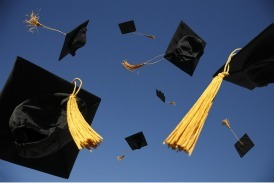 This college graduation story is heartwarming and encouraging. You will find yourself right there listening to the graduation march. Here I sit, way up in the balcony. I’m waiting for my son to march across the floor below with about 900 other gowned and capped recipients. I’m dreading the first sound of that famous traditional graduation processional. It makes me cry. I’ve been playing it on my computer all week in preparation. It makes me cry there too. Like a sudden flash of lightening, he’s gone--impatient to get started--and I’m settled back down to the barrage of too many memories. Some are precious and dear. Some are painful and make me too sad to think about. I glance down at the pin attached to the lapel of my blouse. It’s a tiny bear, seeming to leap in the air. He’s wearing a mortar board, but no gown. In one paw he holds a rolled up and beribboned diploma. I gave it to the cutest little guy I’d ever seen on his graduation from kindergarten. As I wait for that same fellow, now tall and movie-star handsome, to proceed with his fellow students to accept the coveted certificates of completion, I wonder how we covered so many years so fast. What began as a seemingly solid little family ended, as so many do these days, in a fractured heap of confusion and disbelief, and as expected, a bewildered child. He was a good kid, always curious and easy and contented. He loved to whistle, especially when engrossed in a project. After the irreparable change in our family dynamics, I didn’t hear that sweet joyous sound anymore. Those straight-A grades slipped so far he convinced himself he didn’t have the energy to even try. There were times I felt we were stuck in neutral or even sliding backwards, but in the end, tired and spent, we survived. As my eyes wander across the hundreds of people gathered to support and celebrate each loved one’s success, I imagine I am not the only parent or student who has spent serious knee-time praying for this outcome. I am not the only one who has wept with exhaustion and doubt and frustration. The first chord of Edward Elgar’s 1901 Pomp and Circumstance march rings out. I catch my breath, tissue at the ready, but find I’m so absorbed in gazing through the old binoculars searching for that dearest of faces that I forget to cry. All the fatigue and weariness has vaporized and I feel strong and so very proud. “There he is,” I squeal to his aunt on my left and his two grandmothers in front of me. “Oh, look how certain and straight he walks,” I gush like a…well, like a MOTHER. When his name is called, he strolls across the stage with his head held high as he accepts his due for diligence and hard work. He pauses at the foot of the steps for the photographer to freeze this joyous moment for us to keep as a reminder that crying is for a season, but if we trust and believe and keep going, joy does come in the morning. His father, who has traveled a long way to be here, is right behind me, just as pleased as I am to see our wonderful child marching with poise and self-confidence into a bright future. I turn around for confirmation of my assessment. His answer is short, but as full of a parent’s love and pride in an offspring as the rest of us gathered to rejoice in a commencement. “Yep”, he says as he continues to click frame after frame with the old camera he used for the newborn pictures all those years ago. Our son strides by, beaming, and waves at his family who loves him. The three of us are on our own paths now, but tonight two of us cherish some of the same memories of our beautiful baby boy who has, by God’s grace, grown into a real man. It wouldn’t surprise me one bit to hear some cheerful whistling. Linda Germain is part of our Inspirational-Prayers team.